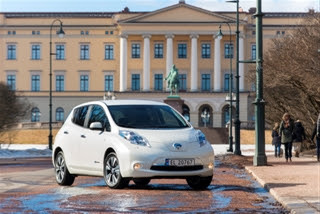 The Nissan LEAF has made history again by taking the number two spot in the overall car sales chart for Norway, beating a host of household name combustion engined cars in the process. This month has not been a one-off success - with the Nissan LEAF taking 5th position overall in the sales charts for 2013 to date, and number 13 overall in 2012. Since the start of sale 18 months ago more than 4,500 of the 100% electric models have been sold in Norway, making it the best selling car in the Nissan range for that market. Nissan Senior Vice President of Sales and Marketing, Paul Willcox expects even greater success with the new model, commenting: "In April we have outsold entire ranges of big name models from other manufacturers with our outgoing model. While the competition are offering multiple body styles, engine types and trim levels, the current Nissan LEAF is a single shape, powertrain and specification car. He continued: "In March we began production of our new Nissan LEAF in the UK with over 100 changes and three levels of trim. With this new European-tailored car hitting showrooms in May we expect the coming months to show the undeniable momentum building behind 100% electric vehicle sales in Europe. In Norway the Nissan LEAF is now a mainstream car choice for family and business drivers because it performs as well as a combustion engined car, but doesn't produce any emissions." Norway has encouraged the use of electric vehicles for many years with tax and usage benefits, and its progressive policy on electric vehicles is being rewarded with strong take up of zero emission cars. National and local governments in the Nordic nation have reduced VAT to zero, installed electric car only car parks and allowed the use of bus lanes to encourage Norwegians to switch to zero emission cars. To cope with the huge growth in the uptake of EVs, the council in Oslo have recently increased their charging point installations from 100 per year to 200 per year for the next four years. President of the Norwegian Electric Vehicle Association, Snorre Sletvold explained the success, commenting: "It is clear that Norway leads the world in electric vehicle sales per capita and as a people we are very proud of this. We are clearly demonstrating to other countries in Europe and across the globe that if you build infrastructure and put some smart incentives in place people buy zero emission cars and use them everyday." He continued: "We may have big oil reserves, but our government sees encouraging electric vehicles as an investment in reducing pollution, raising air quality and improving public health, I hope other countries will learn from this." The sales success of the Nissan LEAF comes before the new European-manufactured version of the car comes to market, bringing with it 100 improvements over the current model. The enhancements include increased driving range of 199km, 50% faster charging, 40 litres extra boot space and a 70% more efficient cabin heater, significantly improving winter driving range. In addition the suspension has been optimised for Europe and a new dark coloured interior option added in response to customer feedback. The new Nissan LEAF is now available in three grades with a new entry Visia grade, which offers a lower starting price to the range and a technology packed, leather trimmed Tekna grade as the premium specification option.